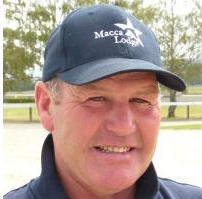 Brent and Sheree McIntyre have been operating Macca Lodge at Wendonside, just a few miles from Riversdale, since 2008. They bought the stud from Charlie and Ailsa Smaill who had transformed their 240-hectare sheep and cattle farm into Jaccka Lodge by the mid-1990s. Brent admits he can’t take the credit for the subtle name change — his mates, on hearing about the purchase, told him “it’s Macca Lodge now”. Hard to argue with that. Former sheep farmers at Tussock Creek near Invercargill, the McIntyres have relished their move into the stud business. Like his grandfather and father before him, Brent trained horses on the farm and had success with the good mares Just Jazzan (six wins), her daughter Bonnie Lass (10 wins) and Jamie (seven wins). The latter two are still in the well-bred broodmare band at Macca Lodge. And the harness racing family tradition will be kept going by the next generation. Caine McIntyre joined his parents in partnership in 2013. Brent’s experience in all aspects of breeding and husbandry helps create a professional and friendly atmosphere where all the horses thrive. Visitors to Macca Lodge are most welcome. Brent, Caine and the team are always happy to chat to breeders and listen to feedback and comments. Macca Lodge is proud to support harness racing in the south including the Macca Lodge/Nevele R Southland Oaks, the Junior Driver Series and all clubs in the south with financial sponsorship. Macca contributes sponsorship worth $10,000 each season to help clubs provide races for our breeders. 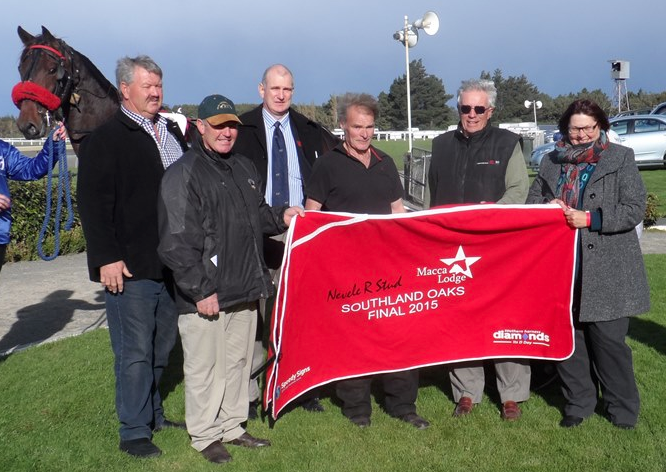 They also sponsor the “Trained South of the Waitaki” race on Show Day as well as a winter series for southern-trained horses. As co-sponsors of the Southland Oaks, Brent (with the cap) and Sheree McIntyre were on hand to make the presentation to the winner Smokin Bird’s owner, Kevin Court.